"This is a story of a boy who grows to be the most powerful and famous Hexblade that ever walked the earth." At the turn of an era, an unlikely occurrence is born into the world, able to wield magic and control the origin of life, Irhamel Stingryn starts his journey into Magic and Military Arts. This is a story of a boy who grows to be the most powerful and famous Hexblade that ever walked the earth. The Celestial Blade has not been tagged yet. Help others find The Celestial Blade by tagging it! 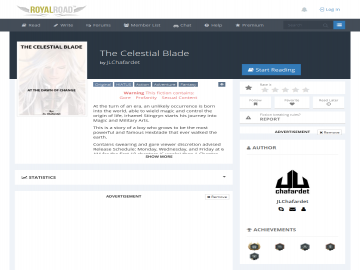 The Celestial Blade has not been reviewed yet. The Celestial Blade has not been recommended yet.